Product prices and availability are accurate as of 2019-04-10 02:01:51 EDT and are subject to change. Any price and availability information displayed on http://www.amazon.com/ at the time of purchase will apply to the purchase of this product. 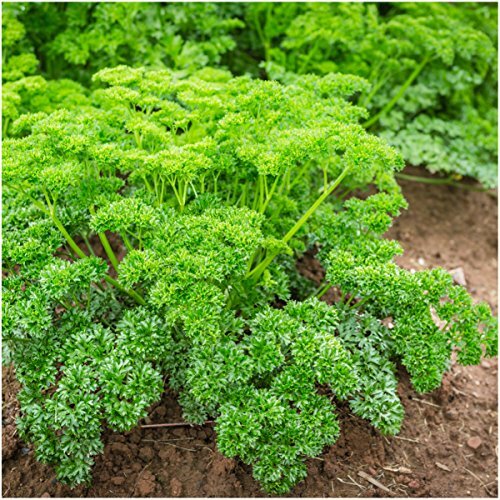 Grow a garden filled with Triple Curled Parsley, from freshly harvested Petroselinum crispum seeds. Triple Curled Parsley is a more decorative variety, which is popularly used in garnishing. Some can argue that it's flavor is not as strong as it's flat leaf relative. This variety is a bit more attractive however, growing to a mature height of only 10 to 20 inches tall. The leaves form a compact growth habit, much like that of a miniature bush. 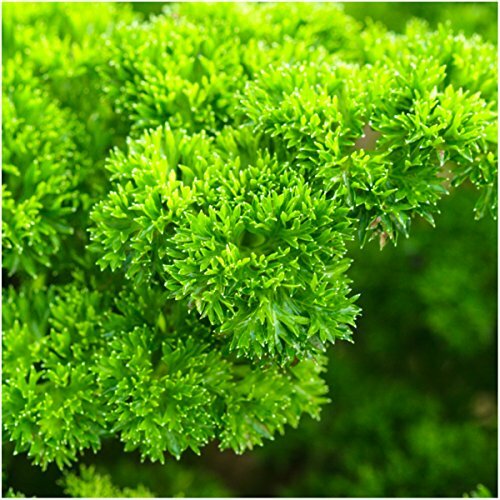 These herbs can be grown in pots and containers, or directly in the garden as well. You can even grow them alongside other low growing flowers, such as pansies and violas for an attractive, vibrant green display. 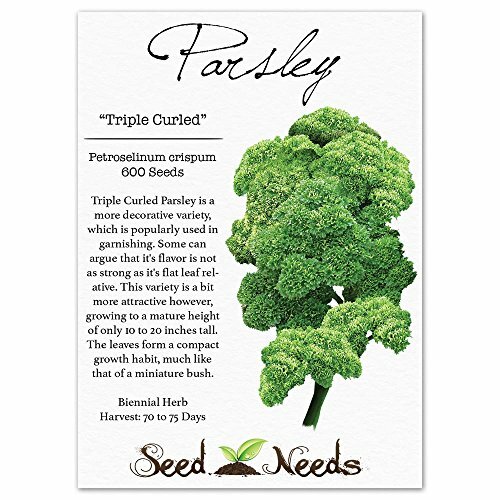 Triple Curled Parsley is categorized as a biennial herb. They grow quickly from freshly harvested seeds, displaying there dark green leaves through the late Spring and early Summer months. Triple curled Parsley is not too fond of heat and will grow slowly through the summer months. Planting in early Spring and early Fall is recommended. The plants can return the following year to flower if the roots aren't damaged and the winter isn't too harsh. Allowing these plants to flower in it's second year of life can result in the harvesting of fresh Parsley seeds. Be weary of caterpillars when growing this variety of Parsley, since they will eat them up as quickly as you will. To harvest, simply clip a small portion of the leaves at any given time. Quality Parsley seeds packaged by Seed Needs. Intended for the current and the following growing season. Packets are 3.25" wide by 4.50" tall and come with a full colored illustration on the front side, as well as detailed sowing instructions on the reverse. 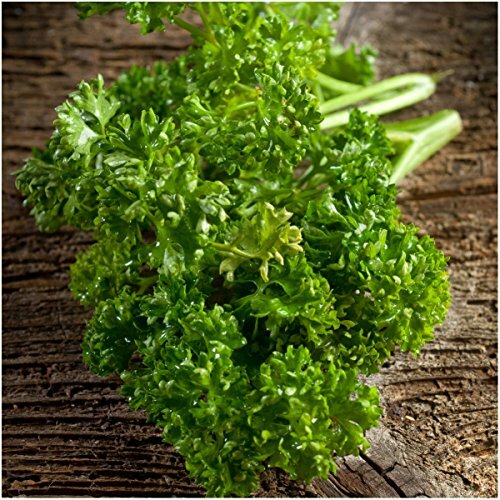 Triple Curled Parsley is a more decorative variety, which is popularly used in garnishing. Some can argue that it's flavor is not as strong as it's flat leaf relative. This variety is a bit more attractive however, growing to a mature height of only 10 to 20 inches tall. The leaves form a compact growth habit, much like that of a miniature bush. These herbs can be grown in pots and containers, or directly in the garden as well. You can even grow them alongside other low growing flowers, such as pansies and violas for an attractive, vibrant green display. 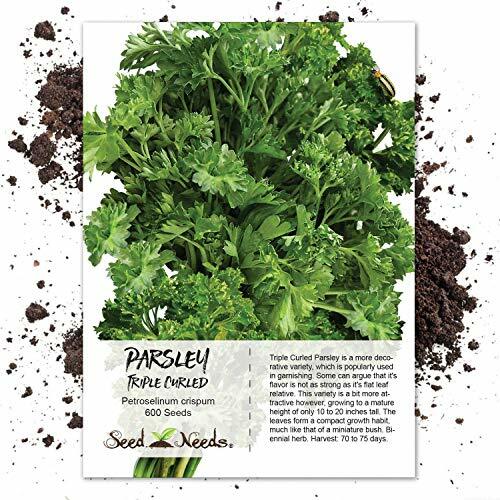 All Parsley seeds sold by Seed Needs are Non-GMO based seed products and are intended for the current & the following growing season. All seeds are produced from open pollinated plants, stored in a temperature controlled facility and constantly moved out due to popularity.